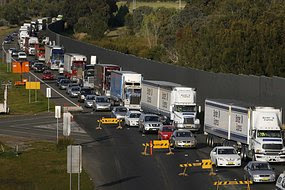 There are calls for state and federal govts to abandon new transport changes to get trucks back on the road. A spokesman for South Australian truck owners and drivers, Robert Harrowfield, says the drivers all worked for the same company. They were warned they would be out of a job if they joined the national stoppage. 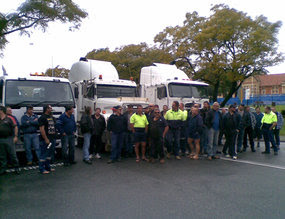 About 70 truck drivers met in Adelaide to discuss concerns including fatigue and higher fuel prices. A further meeting has been scheduled for Wednesday. One driver's partner, Glenda, hopes the public will sympathise with drivers and their families. "My partner works very, very hard - he's constantly tired and when he gets home he just wants to fall into bed," she said. "Weekends are spent trying to catch up on that sleep - basically you don't have a life. "He's trying to do his best and it's not easy when nobody wants to give him a break."